27-year-old female presented with spontaneous symptoms and signs suggestive of isolated talonavicular septic arthritis. This was treated by an open arthrotomy and washout. Staphylococcus aureus was grown from the joint and found to be sensitive to gentamicin and flucloxacillin. The surgical treatment and a 6 week course of oral antibiotic therapy resolved the acute infection. Unfortunately, as a result of the septic arthritis, the patient experienced ongoing pain from the talonavicular joint such that 18 months after the infective episode, she sought treatment for the pain. Plain radiographs showed a narrowed joint line at the talonavicular joint. No other investigations suggested ongoing presence of infection. The patient underwent a talonavicular fusion utilising the incision for the index surgery. After thorough debridement by resection of the articular surfaces with chisels, further tissue samples were taken. Given the sensitivities of the original organism, STIMULAN paste was injected into the joint with locally administered gentamicin before compression across the joint was applied with the internal fixation. 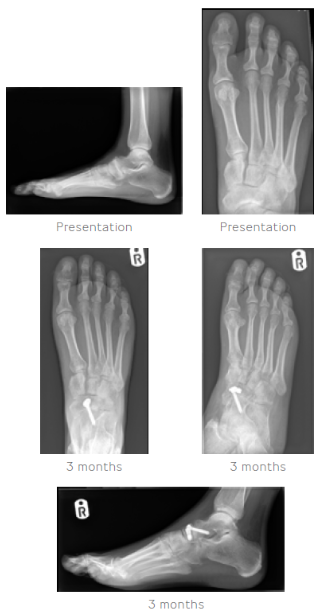 At 6 months’ follow-up, the arthrodesis procedure was successful and the patient remains pain free. Note: See STIMULAN page for regulatory statements.